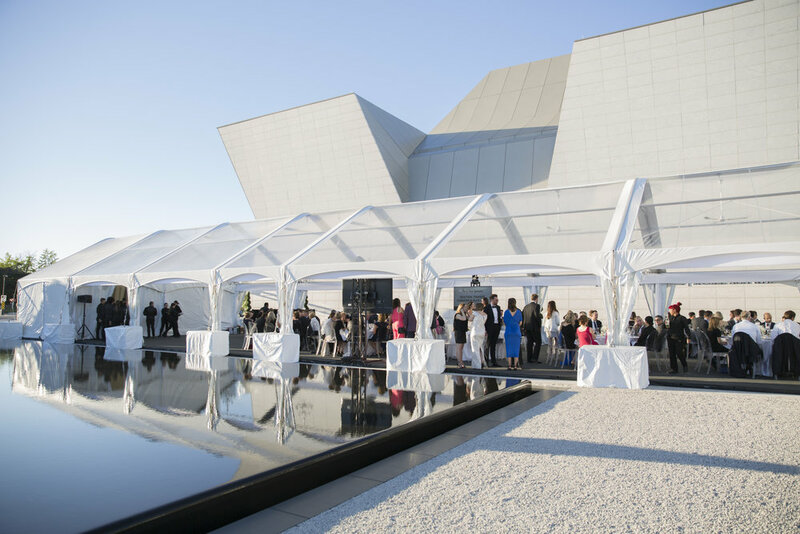 In June, I was asked to assist with planning a very special fundraiser for the Women's College Hospital Foundation at the Aga Khan Museum. The goal was to raise $1 million to support continued research in the fight against cancer. The fundraiser was hosted in partnership with Lisa McCann, and the Walter family, whose beloved mother and figurehead, Liz Walter, passed away from pancreatic cancer in March 2017. On June 21st, guests were invited to this stunning venue for a night of music, delicious food, and wonderful entertainment. Cocktail hour was hosted in the museum’s indoor courtyard, with music from Wellington Music. Dinner, hosted by ETalk's Traci Melchor also took place outside, under a beautiful tent by Premiere Event Tent Rentals. Following dinner, guests were invited into the Aga Khan's auditorium for an evening of laughs and music, featuring none other than Martin Short, Jackie Richardson, Amy Sky, and Mark Ezra. We also had a silent auction, featuring gifts from local Toronto fashion designer Narces, the Odon Wagner Art Gallery, and Tasco appliances and Cameo kitchens. Other sponsors included beer from Steamwhistle brewery, cider from Mill St. Brickworks, and wine from Halpern enterprises. One of my favourite features of the evening was our interactive lightbox. I commissioned a beautiful illuminated lightbox, wrapped with the events’ logo by Event Grafitti. Guests were asked to write a note for a loved one lost to cancer, or to leave words of inspiration on a adhesive musical note or star. At the end of the night, the lightbox was glowing with the music notes and stars left by guests, and was the last things guests saw as they made their way home. A wonderful sendoff to remind guests why they all attended and contributed to such a beautiful cause. The venue was phenomenal to work with. Sonia and Wendy are both total experts in their fields, and made the entire process of venue operations such a breeze. Being an expert in venue management myself, it was such a pleasure working with two women who were completely on the same page as myself. They were always positive, accommodating, and more than willing to go above and beyond to make the evening a success. For the dining space, we chose ghost chairs, a simple clean white satin linen, platinum band plate ware, silver cutlery, and a lovely white arrangement with peonies, roses, and hydrangeas. It was important that not only did we stay on budget, but that we created a space that looked clean, crisp, elegant, and understated. We knew the colours from everyone's dresses, the food, and the teal and blue printed menus would be enough to add that pop of colour we wanted. What a wonderful night to remember. A guess what- we hit our goal! All thanks to the amazing team of people working with me. Thank you so much WCHF for allowing me to be part of this night.